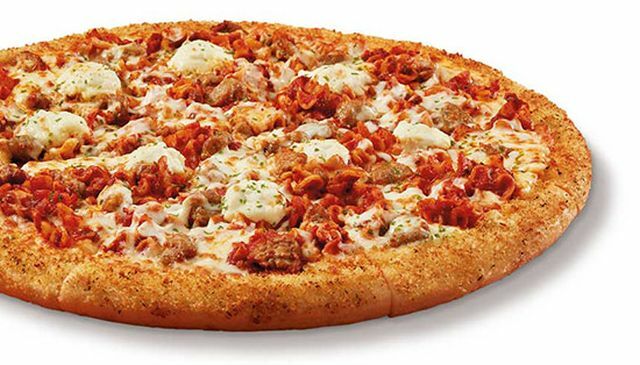 Little Caesars looks to be testing a new, pasta-topped Lasagna Pizza in select locations in Ohio, West Virginia, and Georgia. The pizza takes the chain's standard large 14" round pizza and gives it a toasted Parmesan breadcrumb crust, while topping it off with meaty marinara sauce, mini ribbon pasta, Italian sausage, and a blend of mozzarella, Muenster, and ricotta cheeses (Little Caesars' standard cheese blend consists of just mozzarella and Muenster cheeses). The Lasagna Pizza is selling for $9 each and is available Hot-N-Ready from 4 to 8 PM daily. The item seems to be a test rather than a regional offering as it does not appear to be available at all in some of the larger metropolitan areas in the listed states. Verified areas that are offering the pizza include: Savannah, GA and Huntington, WV (which includes nearby towns in KY and OH).